I hope you had a nice weekend yes... my computer is back hooray! It was nice and quite refreshing to have a couple days offline and to be disconnected especially since last week was a bit crazy. Do you ever have unplugged or technology free days? I dare you to try it sometime, even for just a day ... no phone, no computer, tv, no other electronic devices... could you do it? As for Music Monday, here is a video I came across recently and enjoy, I hope you do too. It is chill music from the band called Jonny. Find the song and album here or here*. I am drawn to the beautiful nature scenes and horses. My daughter is also kind of obsessed with horse movies like the Black Beauty and The Black Stallion lately. (They are both excellent, if you haven't seen them. The cinematography in the Black Stallion is breathtaking.) Happy Music Monday! *A tiny % of purchases made from these links will support B*E.
I love this, I make mixes every Money and I want to add this for next week's post. So lovely. Great. Your blog looks lovely, thanks for sharing. we've been limiting our technology time or "plugged in" time, and it's great! once the clock strikes midnight, all our electronics are off. i would love to have a day of no electronics - i think i'd be more likely to take a walk or read a book then. wonderfully refreshing. 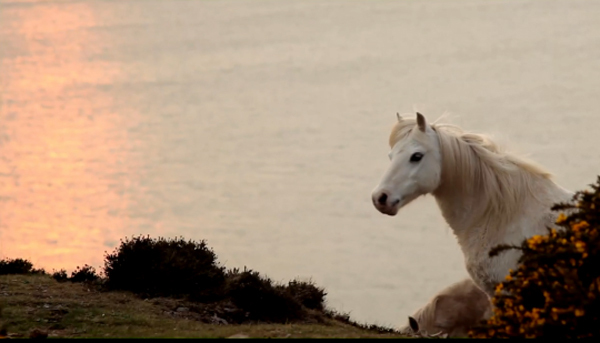 the white horse :) lovely. thanks for sharing. Oh, I love horses, too. I also LOVED the Black Stallion as a girl and loved reading the book Black Beauty. And has she seen National Velvet? You should bring your girls up sometime. We can take a walk down to the nearby horses. p.s. I hadn't heard of this band. Great song! Oh wow I loved this video - thanks for sharing. I have some great shots on my blog of white horses. Love horses! I loved horse movies too when I was young - "The Man From Snowy River" and "Wild Hearts Can't Be Broken" were my favorites.